The US-Russia Backed Cease-Fire in Syria Hangs in the Balance: Will Cooler Heads Prevail? The only way to end the conflict is through a political settlement, which House Democrats now are wisely urging on the administration. The unraveling of the September 9 cease-fire deal between the United States and Russia in Syria comes amid allegations and counter-allegations of cease-fire violations and war crimes. UN Ambassador Samantha Power, who habitually mistakes moral posturing for diplomacy, told the UN Security Council on September 25 that “what Russia is sponsoring and doing is not counter-terrorism, it is barbarism”—before storming out of the UN chamber during the remarks by the Syrian ambassador. Yet in separate appearances on Thursday in Washington, Secretary of State John Kerry and Deputy Secretary of State Antony Blinken mercifully refrained from indulging in similar theatrics. Speaking at the Washington Ideas Forum, Kerry admitted there were “huge levels of mistrust on either side” of the US-Russia divide over Syria. Kerry told The Atlantic’s Steve Clemons that he recognizes that part of the mistrust on the part of the Russians stems from their belief that the United States is not entirely serious about fighting the Nusra Front. But Kerry also observed that cooperation “is not possible” with Russia while it continues its air campaign over Aleppo, which he described as “indiscriminate, beyond the pale” and against “the laws of war” and “common decency.” As such, the Obama administration is “on the verge of suspending the discussion” with Russia regarding a settlement in Syria. Yet Kerry held out hope that cooperation in the form of a cease-fire was still possible; after all, what are the alternatives, wondered the secretary: Is America going to go to war in Syria? “I don’t think so,” said Kerry. Instead, there needs to be what he described as a “rational, moral, common-sense approach” to end the conflict. 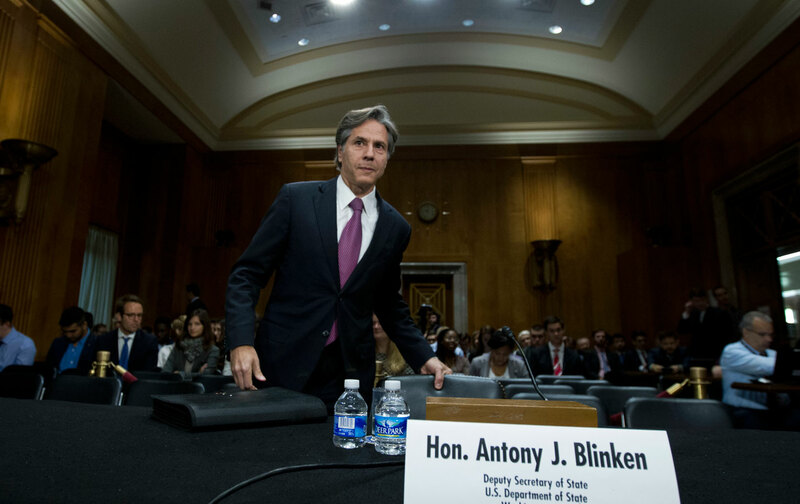 Blinken’s message satisfied his interlocutors not a bit (perhaps the State Department should’ve sent Ambassador Power?). Tennessee Senator Bob Corker—after complaining about how the White House doesn’t return his calls (seriously)—ripped into Blinken and Kerry, complaining that cutting off talks with the Russians isn’t “much of a price” for Russia to pay. Left unmentioned by the senators was that some of that vaunted American “boldness” is partially responsible for the unraveling of the ceasefire. Only days after the agreement was concluded, US airstrikes purportedly meant for ISIS hit Syrian troops instead, killing 62 and wounding 100. At this stage—after two ill-fated American “train and equip” programs it—should be obvious to all but the more indiscriminating cheerleaders of American military intervention that little good can come from our continued presence in Syria. The idea that there are (a) core, definable US national interests at stake in Syria and (b) identifiable and supportable moderate non-Islamist Syrian rebels is simply not supported by the facts.